Why play Keep It Real RX? In a world where technology exceeds our wildest expectations, we are still without tools with which to unlock and discover the most precious and fundamental parts of ourselves. We long to speak and reveal our thoughts, feelings and desires. We hope to find those with whom we can truly share our innermost secrets and dreams. We search for connection which has meaning. We want to heal and use our hearts and minds in ways that bring hope and possibility. In other words, we long to be…HUMAN. Where do we get feedback about our lives and the complexity of how experiences have affected us? Where are we taught about the power of emotions and how they influence us? How do we find our way? Where do your prejudices and blind spots lie? Where are your hurts and fears? What do you really think about deep down inside? The Keep It Real RX game provides a rare opportunity to go beneath the surface, to go beyond ordinary conversation, to truly learn from one another in ways which can impact our lives for the better. How is the Keep It Real RX game different from other games? The Keep It Real RX game is a place where people can share what dwells deeply within their hearts and minds. No other game affords this soul to soul communication. Playing the Keep It Real RX game helps the players to take off their masks and game face, and provides a safe place for people to be authentic with one another. It is an incredibly fun game, which at the same time helps players to connect on a human level, creating peace and understanding. Keep It Real RX is a bold and courageous game that goes where no game has gone before! Why the tag line “Prescription for the human condition”? We are all in this life together. Ultimately, we are all either going to sink or swim together. DIALOGUE is what really changes things. Life is an inside game. If we can’t talk to each other, we will never go beyond where we are. We all have so much to learn from one another. There are many undiscovered treasures within every person. We all need to open our hearts and minds and try to consider each other’s point of view, to listen, reflect, to share, to experience each other on deeper levels. Why did you create the Keep It Real RX game? I personally get tired of small talk. I want to know about the humanity of people, what really goes on in the depths. It is difficult to open up deep conversations, and they can quickly become a dense, dark forest with no way out. I invented the Keep It Real RX game as a place where one can enter the forest, muck around there for awhile, but then can easily exit into new terrain on the next roll of the dice. The questions range from light and breezy to the depths of the human experience; each roll of the dice brings us to a new adventure. I created the Keep It Real RX game to celebrate the extraordinary diversity of the human experience! The most important thing for the mental health of a person is to feel connected to others, to be seen and heard for who they really are. I am a psychotherapist and have been a social worker for 40 years. I have been consistently aware of the profoundly healing effect generated in people when they are presented with the opportunity to express themselves freely. It seems simple, yet as we know, there are few situations in which people are brought together in which they are presented with the opportunity to share this type of experience. I hope this game will enrich people’s lives. What are the Benefits of playing the Keep It Real RX game? The Keep It Real RX game triggers meaningful dialogue, spontaneity, relaxation, bonding, a full range of communication, and mutual enjoyment. 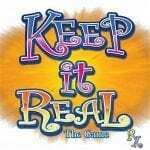 Keep It Real is first and foremost, fun and entertaining. However, as a byproduct, it has many additional built-in benefits. It is an opportunity for people of all ages to explore their imaginations, express emotion, overcome shyness, develop creativity, reflect on their beliefs and experiences and share them with others, take risks, loosen inhibitions, hear different points of view and ways of handling things which can give them new perspectives, gain confidence in speaking in front of a group, and have a great time listening and sharing with one another. It can also serve as an ice-breaker, a tension distiller, and a relaxing way for people who know one another to re-connect and to connect in new ways. The Keep It Real RX game is non-confrontational and gently allows each player to join in at their own pace, and in their own time. The result is that players gain a sense of companionship and of belonging. Playing this game has proven to reduce feelings of alienation, as the game play allows each player to make a positive contribution in sharing their thoughts, feelings, beliefs, dreams, memories, creativity, and imaginations. Sharing of one’s authentic self raises self-esteem and brings about emotional closeness, which can act as an antidote to depression. The Keep It Real RX game is a place where strangers become friends, friends become comrades, and everyone sees one another with new eyes. Your life will thank you!